Well, that's what the calendar says anyway!!! Headlines today about an arctic blast in the northeast may prove otherwise for some of our readers! Here in Chicago, we'll probably see the mid-50's. I thought we'd celebrate "Spring Fever" ('cause after this winter, I can't WAIT for it to get nice out again ... and STAY nice out!!!) by looking back at some of the #1 Hits on this date over the past 60 years. This week's #1 Record in Billboard has been holding that position for the past eleven weeks ... and it is, without question, one of the best songs out there in a long, long while. Harkening back to the sounds of 1965 and 1975 ... the James Brown Funk Era ... Mark Ronson and Bruno Mars have TOTALLY captured the sound and feel of this era ... which means they'll probably be sued by Marvin Gaye's family any day now! 20 Years Ago Today ... March 20th, 1995 ... found Madonna topping the chart with her latest, TAKE A BOW. This record spent SEVEN weeks in the #1 Spot on Billboard's Hot 100 Pop Singles Chart. Flashback 25 Years Ago Today ... March 20th, 1990 (God that's SO hard to believe!!!) ... and you'll find JANET JACKSON wrapping up her third and final week on top of the chart with ESCAPADE. 30 Years Ago Today, REO Speedwagon found themselves in a similar position, enjoying a three week run on top with CAN'T FIGHT THIS FEELING, one of those songs we still hear all the time here in Chicago. Step into the time machine and set the dial to March 20, 1980, and you'll find Queen topping the chart with their rockabilly revival hit CRAZY LITTLE THING CALLED LOVE, another guaranteed daily airplay track some 35 years later. March 20th, 1975 found The Doobie Brothers on top with their first #1 Hit, BLACK WATER. (They'd hit #1 again five years later with What A Fool Believes). On March 20th, 1970, Simon and Garfunkel were enjoying the biggest hit of their careers when BRIDGE OVER TROUBLED WATER topped The Billboard Hot 100 Pop Singles Chart for six straight weeks. The duo split up shortly afterwards, figuring they could NEVER top the success of this record. 55 Years Ago Today, March 20th, 1960, we were treated to one of the longest running #1 Records of the '60's when Percy Faith's THEME FROM "A SUMMER PLACE" spent one of its nine weeks on top of the chart at #1. And there you have it ... our First Day Of Spring Flashback!!! You scooped the world with this one!!! immediately was the 4 Preps CINDERELLA out of 1958. P.S. Incidentally here in Oklahoma this weekend in a town not too far from OKC, the Temptations and 4 Tops are appearing in concert for one night. I was immediately reminded of your discussion this past week concerning original members in the groups, etc. The craziness surrounding the "Blurred Lines" / Marvin Gaye copyright controversy continues ... last week the courts decided that Robin Thicke and Pharrell Williams were guilty of copyright infringement and ordered to pay the Gaye family $7.4 million ... then Gaye's family said they were seeking to block any future sales or airplay of "Blurred Lines" (a bit extreme really ... just cut them in for a share of the royalties and then let them play the hell out of it ... EVERYBODY wins!) ... then Thicke and Williams said they would appeal the judge's decision (or possibly even file a counter-suit). After a recent copyright decision regarding Sam Smith's infringement on the Tom Petty / Jeff Lynne song "I Won't Back Down" (a BLATANT rip-off in my opinion ... something I noticed the very first time I heard it ... although all parties seem to have amicably agreed that this was probably more of an unconscious / subconscious thing ... remember the George Harrison / "My Sweet Lord" / "He's So Fine" case??? ), one cannot help but wonder if this will be a new trend in music. (Kind of surprising in a way with all the "sampling" that's been going on for the past few decade now!) Like Frannie says, is there even such a thing as a new, original idea anymore? Is there ANY melody that can be constructed that doesn't in SOME small fashion resemble some nuance of the MILLIONS of songs that have been written and recorded in the past? More great stuff from that Jeremy Roberts / Mark Lindsay interview ... now up to Chapter 5!!! Jimmy Sacca, lead singer of the Hilltoppers, died 3/7/2015. He was 85 years old. The Hilltoppers bridged the gap between early pop and the Rock Era. Random thoughts about today's Forgotten Hits. Frankly, at this point, I'd pay 100 bucks to AVOID seeing The Steve Miller Band. I'm also burned out on Steely Dan. God, I love the group and the brilliance of Donald Fagen but I always have this empty feeling when I leave their shows. Maybe, I would feel better if I thought Donald was actually enjoying himself. New York, NY (March 11, 2015)– International superstar Shania Twain wrapped up her successful two-year residency in Las Vegas, NV as her SHANIA: Still the One stage show came to a close in December. The five-time GRAMMY winner entertained concert-goers from all over the world at the Colosseum at Caesars Palace during the course of her 105 performances and now, fans have an opportunity to bring the Vegas production home with the release of Twain’s live Blu-ray and DVD SHANIA: Still the One Live from Vegas via Eagle Rock Entertainment on April 7, 2015. Produced by Twain and directed by Raj Kapoor, Live from Vegas captures the full SHANIA: Still the One stage performance, plus the bonus feature “Backstage Pass,” which boasts over an hour of never-before-seen behind-the-scenes footage tracking the conception, training, rehearsals, costumes and all decisions in-between that go into creating a one-of-a-kind experience for the audience. The show – a powerful journey through Shania’s biggest hits, country favorites, and beloved crossover songs – features a 13-piece live band, dancers, trained horses, a flying motorcycle and plenty of Vegas flash. With more than 75 million albums sold worldwide and U.S. sales topping 34.5 million, Twain remains the top-selling female country artist of all time. Her 1997 release Come On Over has sold in excess of 15.6 million making it the top-selling country album and places it in the Top 10 all-genre best sellers of all time. Hoping to catch Shania's Farewell Tour? Filmed in High Definition on July 25, 2014, Live At The Orleans Arena Las Vegas is a sonic showcase of Styx’s live prowess and razor-sharp musicianship. This show features the band, backed by huge video screens, performing a set list packed with hit songs, classic tracks, and fan favorites, including “Lady,” “Too Much Time On My Hands,” “Rockin’ The Paradise,” “Come Sail Away,” “Fooling Yourself (The Angry Young Man),” “Renegade,” and “Suite Madame Blue.” The evening also held a special surprise when Don Felder – former Eagles guitarist – took the stage to join the band on “Blue Collar Man (Long Nights)”. In addition to the live set, Live At The Orleans Arena Las Vegas features a bonus interview with band members Tommy Shaw (vocals/guitar), James “JY” Young (vocals, guitar, keyboards), Todd Sucherman (drums), Lawrence Gowan (vocals, keyboards), Ricky Phillips (bass, backing vocals), and Chuck Panozzo (bass guitar). Formed in Chicago in 1972, Styx played a key role in defining the AOR genre, and established themselves as one of America’s greatest rock bands. Their blend of soaring melodies, hard rock guitar, and prog-rock elements led to millions of global record sales and numerous platinum and multi-platinum albums. With over 40 years of rockin’ under their belt, the band isn’t slowing down any time soon, and will embark on a national tour this summer with Def Leppard and Tesla. See below for dates. A couple of weeks ago Forgotten Hits was all abuzz with news about The Platters ... now this week we've learned about a brand new release by the legendary Coasters!!! (And I'll tell you what ... they're sounding MIGHTY FINE on The Temptations remake we get to feature today, courtesy of Billy James and Glass Onion PR. Los Angeles, CA - America’s premiere R&B vocal group and Rock & Roll Hall Of Fame inductees, The Coasters, have had one incredible, miraculous, astounding ride in the music business. Less of a group and more of an institution, The Clown Princes of Rock & Roll established themselves six decades ago, and in that time have seen many musical fads come and go. But one thing has always remained - the power of a truly timeless song especially when experienced through the prism of the expertly sung 4-part harmonies that are The Coasters stock in trade. 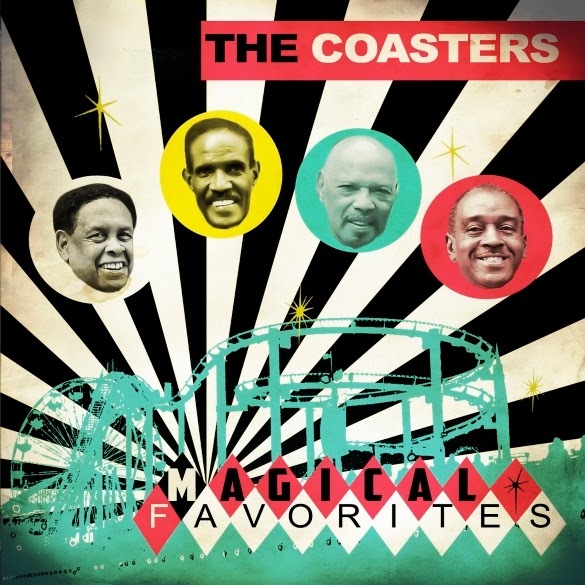 To commemorate the group’s unique and longstanding career, The Coasters are proud to present Magical Favorites a collection of brand new recordings covering some of the very best American rock and R&B classics such as Sam Cooke’s “You Send Me,” The Temptations “Just My Imagination,” Elvis Presley’s “Don’t Be Cruel” and many more - all done in the indelible Coasters way! Magical Favorites will be available March 31 from Goldenlane Records. For those unfamiliar with the group’s history, The Coasters scored their first hit single “Down In Mexico” in the spring of 1956, which they followed in 1957 with “Young Blood” and “Searchin’” the following year. In 1958, the band again hit the chart with two blockbuster hits that would become as iconic as the band that sang them, “Yakety Yak” and “Charlie Brown.” From then on, it was hit after hit for the group with songs such as “Poison Ivy,” “Along Came Jones,” “Love Potion #9,” “Zing Went The Strings Of My Heart” and many more! The line-up of The Coasters that was inducted into the Rock & Roll Hall of Fame in 1987 (Carl Gardner, Billy Guy, Will Jones, Cornell Gunter) have all since passed but their legacy lives on with the help of Joe Lance Williams (tenor / baritone), Primo Candelara (tenor), Dennis Anderson (baritone), and Eddie Whitfield (bass). Three of these gifted vocalists were personally handpicked by group founder Carl Gardner, with Dennis coming aboard in 2011 after Carl had passed. Though often imitated, they have never been duplicated and they continue to do what they do best on both the stage and in the studio, entertain the audience! 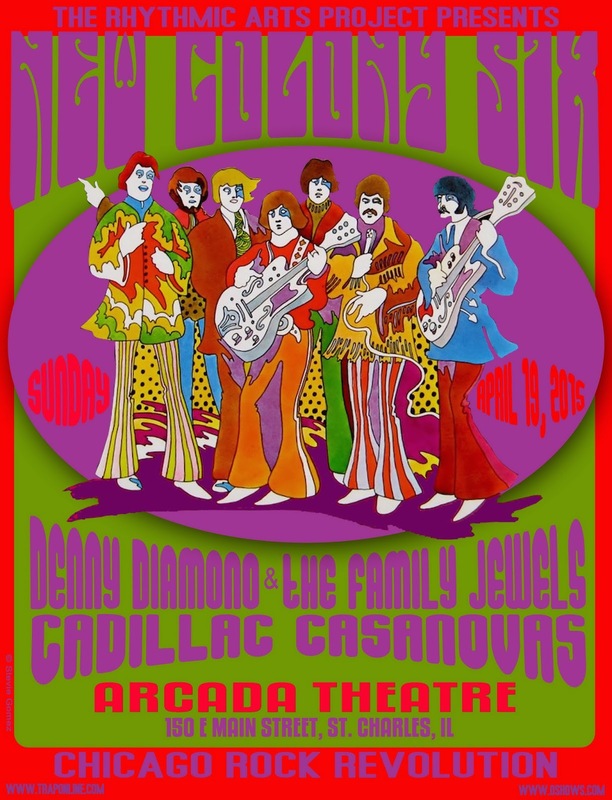 Do you want to buy a ticket or tickets to the AMAZING Chicago Music 60s Style Marty Grebb Benefit Concert May 7 at The Arcada Theatre, St Charles, IL, but are not able to attend? As you may have seen posted recently, we have a way that you can be a part of helping not just Marty but also to expose the awesome Chicago 60s sound to some very talented Chicago kids who otherwise might not be able to see a concert like this!! We carefully selected this organization because it fits the spirit of this event so well. 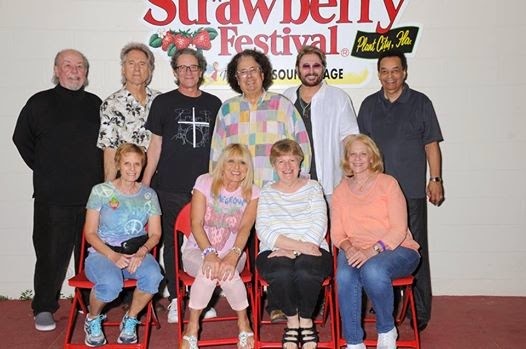 Some friends of mine sat in the red chairs to have their picture taken at the 2015 Strawberry Festival in Florida. Those guys in the back photo-bombed! Oh well, I'll keep the picture anyway! The "Happy Band" was the Godfrey Townsend Band. I've always said they were worth seeing by themselves. Next Month, I'll be back at the Luna Star Café again (one of the few South Florida venues I care about playing these days). As some of you know, I recorded my live album at the Luna and it still has a special place in my mushy old heart. I hope to see a whole mess of you there. I realize that's almost a month away, but I know some of you like to mark your calendars early. I'll send another reminder closer to the time for you less compulsive plan-makers. Candy's book has been called a must-read for Beatles fans of all ages across the globe. And now she will be bringing her book, Beatleness: How the Beatles and Their Fans Remade the World, to the 41st Annual Fest for Beatles Fans, in Rye Brook, NY on March 20-22, 2015. Candy Leonard will be giving presentations and appearing in various panel discussions throughout the weekend. She will be discussing Beatleness and taking questions in a presentation on Friday night, and on Sunday she will participate in a Beatleness Q&A with Beatlefan magazine Executive Editor Al Sussman. She will also be participating the Author’s Panel Discussion on Friday evening and the ‘She’s A Woman … Historian’ on Saturday evening to discuss the influence of women on the Beatles. Candy Leonard is a sociologist and first-generation Beatle fan. She spent years researching and interviewing other first generation fans for her book, Beatleness: How the Beatles and Their Fans Remade the World. Beatleness is a unique analysis of how the Beatles’ constant presence between 1964 and 1970 transformed the childhood and adolescence of millions of baby boomers who then transformed the culture. Candy has also done research on the impact of popular culture on gender relations and family life. She’s a qualitative research consultant to the healthcare and entertainment industries, and blogs about Beatles, boomers, and health at the Huffington Post. For more information on Candy Leonard and her book go to Beatleness.com. Like Beatleness on Facebook, and follow @CandySez and @BeatlenessBook. Dee Elias, author of ‘Confesssions of a Beatlemaniac’, will be making her NY debut at the Fest for Beatles Fans March 20-22, 2015. Confessions of a Beatlemaniac is the true story of a 14 year old Dee Elias and her friends on a two year adventure to try to meet the Beatles. Dee will be bringing her book and her tales to this year’s NY Fest for Beatles Fans in Rye Brook, NY on March 20-22, 2015. Dee will be giving two presentations in the Fest’s Discussion Room about her book and her escapades as a Beatlemaniac in the early 60’s. Dee’s first lecture at the festival will be on Friday evening and the second on Sunday afternoon. When not giving presentations, Dee will be in the Fest marketplace, meeting fans and signing copies of her book. Confessions of a Beatlemaniac takes the reader on Dee Elias’ personal journey to meet the Beatles. Along the way, she tells of her encounters with Billy J. Kramer, Sonny and Cher, and Simon and Garfunkel. For more information about Dee Elias, or to purchase her book, go to: www.ConfessionsOfABeatlemaniac.com. For more information on the Fest for Beatles Fans, go to: www.TheFest.com. The flip of the Riviera's hit CALIFORNIA SUN, H.B. GOOSESTEP, which was mentioned in FH today reminded me of the only time it was played on air here in OKC. Back in the 1960's, one of our local DJ's was named Jim Bowman. He was known on the air as Jim "Goose" Bowman. A lot of times as he was heading into the top of the hours' news, he would play that instrumental. And MOBO is right, in that one would believe that it was done by Johnny and the Hurricanes if they weren't familiar with it. I would buy this IF it were the 1960's book. Hopefully, he will release one like that?? Visit The Record Research Website and you'll find ALL kinds of books to select from. There was an all-'60's book called "Across The Charts" which shows EVERY charted Billboard Hit from the Pop, R&B and Country Charts issued in the '60's. Then you've got the Pop Playlist books to choose from, featuring the biggest hits of every month, available in two volumes ... 1955 - 1969 and 1970 - 1984. Plus TONS more, specializing in just about EVERYTHING chart-aholics like us crave. The brand new Comparison Chart Book shows you the peak position of every single to hit Billboard's, Cash Box's and Record World's Charts between 1954 and 1982. And the list goes on and on and on. Trust me ... you'll find WAY more stuff here that you want than you can possibly buy at one time! (lol) And they're addictive, too!!! Now comes word that legendary film director Martin Scorsese will be filming those shows for a new documentary he's making about the band.